PHOTO BY JILL GOSCHE Calvert High School's Peyton Deats signs a national letter of intent to play baseball at Kent State University during a ceremony at the school Tuesday afternoon. He is surrounded by Brian Rothrock (left), Calvert's baseball coach, and his parents, Brian and Traci Deats. 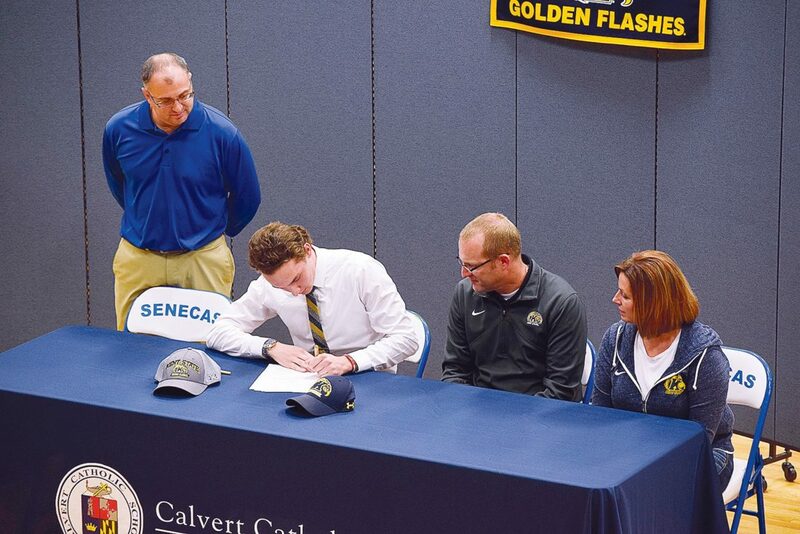 When Calvert pitcher Peyton Deats signed his national letter of intent to pitch at Kent State University, it capped a rather remarkable week for area left-handed hurlers. The senior joined New Riegel pitchers Michael Kirian and Alex Theis, who signed to pitch at Louisville and Ohio State, respectively. Deats said he’s been playing with Kirian and Theis since he was 9-years-old. Deats’ coach, the Senecas Brian Rothrock, said it was rather remarkable. In his remarks to an assembly of students Tuesday, Rothrock said that on average, one out of every 49 kids can play at D-I. As for Deats, he joins a top Mid-American Conference program. The Golden Flashes won the conference title last season and reached the World Series in 2012. When asked what appealed to him about Kent State, Deats said it was the bond he developed with the coaches. Deats said he started to believe he could be a Division I pitcher after his sophomore season. “I was getting calls from Division I coaches, and that’s when it really hit me, like, ‘wow, I can really make this dream a reality,'” he said. Rothrock has coached some top area pitchers, including Hopewell-Loudon graduate Logan Sendelbach, who is now in the Pittsburgh Pirates organization. Rothrock said what separates Deats — and all the top players — is a simple thing. But before he gets to that next level, Deats said he has some work left at Calvert. “I’m hoping to get pitching time my freshman year and hopefully by sophomore year be one of the everyday starters for them,” he said.